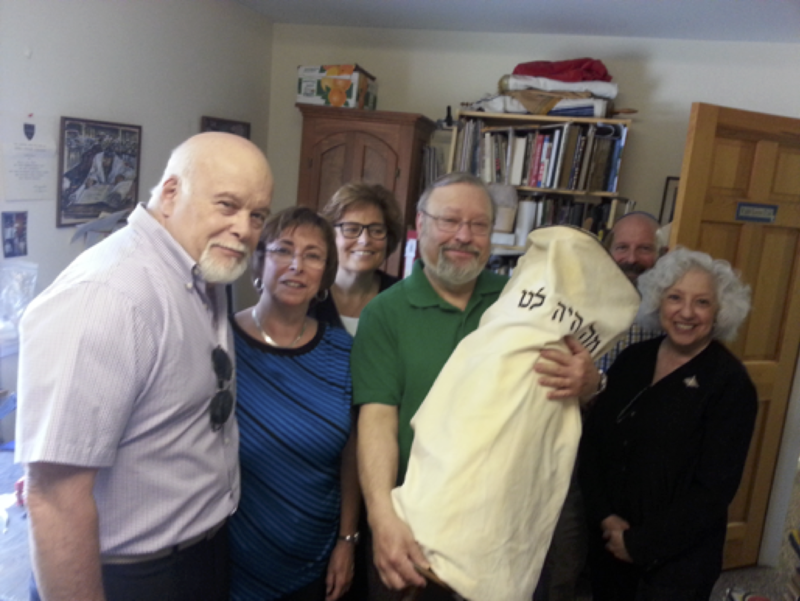 In May 2012, we acquired a Holocaust Torah. This is a “saved scroll”, recovered after WWII, from a destroyed community in Europe. 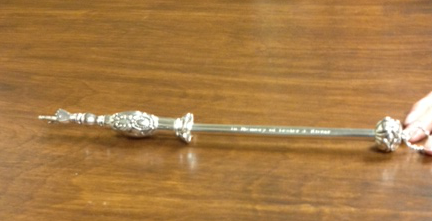 We have become shomrim (guardians) of this Torah and we are honored to have it in our congregation. 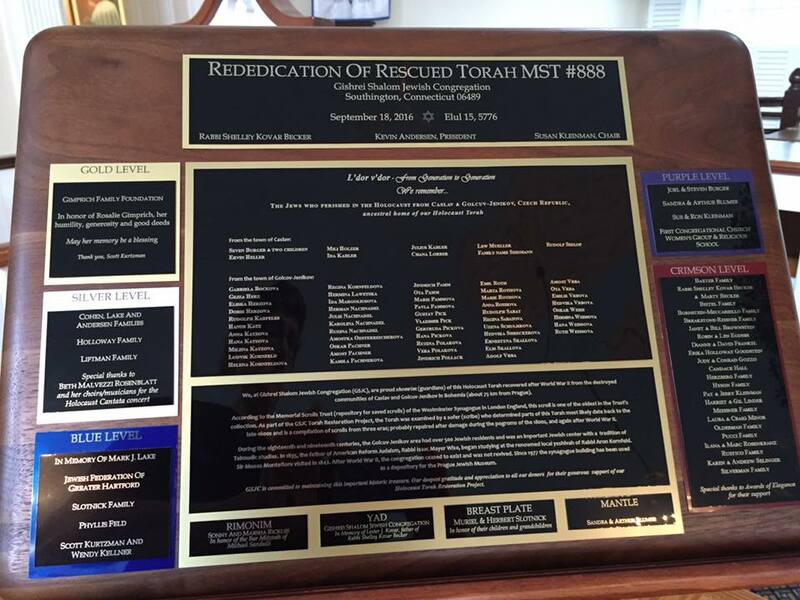 Our scroll comes from the Memorial Scrolls Trust, MST#888, (the repository for saved scrolls) at the Westminster Synagogue in London, England. It was recorded by the Jewish Museum in Prague as having been collected from Caslav-Golcuv-Jenikov. For more information see “The Jewish Sights of Bohemia and Moravia” by Jiri Fiedler, published in 1991. 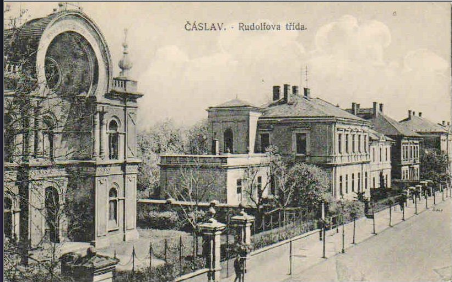 The author notes the following: Caslav is a town in Bohemia, 70km ESE of Prague. Up to the mid-19th century only one Jewish family was allowed to reside in Caslav. When the Jews were granted civic equality under law in the mid-19th century, Jews from the neighboring villages started to move to Caslav. rA Jewish congregation was founded in 1870 and it numbered about 300. The congregation numbered 119 in 1930 and ceased to exist after WWII. There is a synagogue building from 1899 still standing, and a Jewish section (since 1884) in the municipal cemetery. Golcuv-Jenikov is a town in Bohemia 80km SE of Prague. Jews settled there most probably in the Middle Ages. A Jewish community and a synagogue are recorded only in the mid-17th century (earlier records were destroyed during a fire). 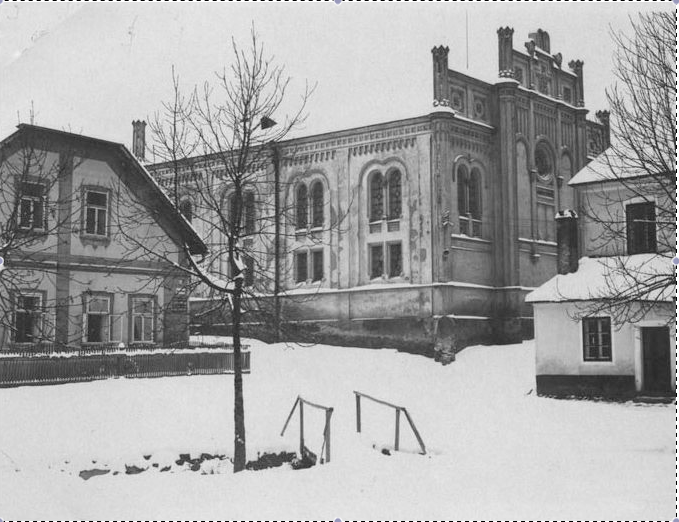 It was an important Jewish center in the 18th-19th century (over 500 Jews) with a tradition of Talmudic studies. The father of American Reform Judaism, Rabbi Isaac Mayer Wise, began studying in 1835 in the renowned local yeshivah of Rabbi Aron Kornfeld. Sir Moses Montefiore visited the yeshivah in 1842. Most of the Jewish families migrated to large towns at the turn of the 19th/20th century. The Jewish population numbered only 79 in 1930. The community also had a rabbi until 1930. After WWII, the congregation ceased to exist and was not revived. Most of the Jewish Quarter has survived up to the present. Remains of a mikvah are preserved in the basement of the former school. The synagogue, dating from 1870, was built in the Moorish-Romanesque style. The aron ha-kodesh has been preserved. Currently (since 1977) the synagogue is used as a depository of the State Jewish Museum. The cemetery is 750m NW of the synagogue. It is said to have existed as early as the early 14th century, the oldest preserved tombstones date from the early 18th century. 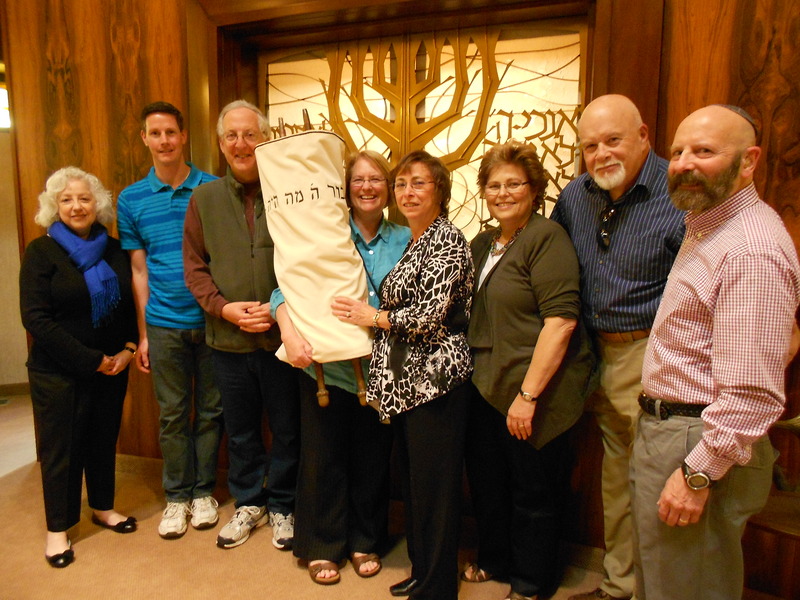 As a result of guarding this sacred scroll, we are focused on two Holocaust Torah Projects. First, we are researching and compiling a list of the Jews who were deported from the towns of Caslav and Golcuv-Jenikov so that we can remember them in our memorial services. Second is the restoration of the Torah. 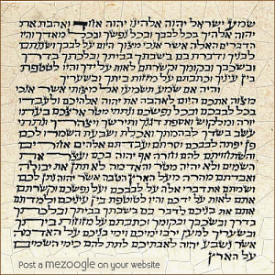 We have begun by having the Torah examined by a sofer (scribe). 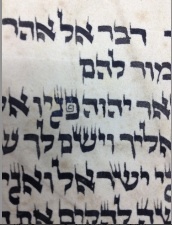 After examination, we were told that parts of our Torah most likely date from the 17th century. It is a compilation of scrolls from 3 eras: probably repaired after being damaged during pogroms in the late 1800’s and again after World War II and is in need of significant repairs now. The most obvious damage is ripped parchment and stitching that is coming apart. The previously made repairs need to be redone and many of the letters are fading and need to be rewritten. If you would like to be a part of our Torah Restoration Project, please consider making a contribution. A donation is a special way to remember friends or loved ones who have passed away or to honor people or special occasions. Thank you for your support. You may make donations via mail (GSJC, PO Box 777, Southington, CT 06489). 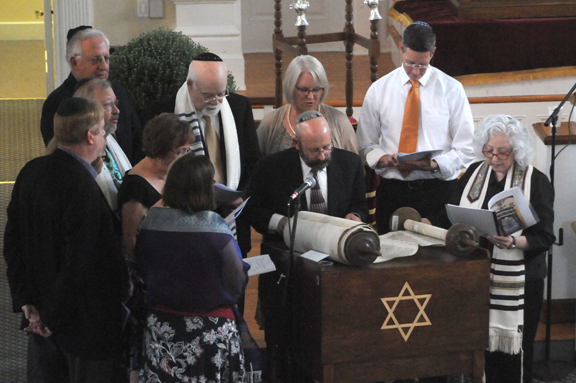 On Sunday, September 28, 2016, GSJC held a ceremony of rededication for our Holocaust Torah. 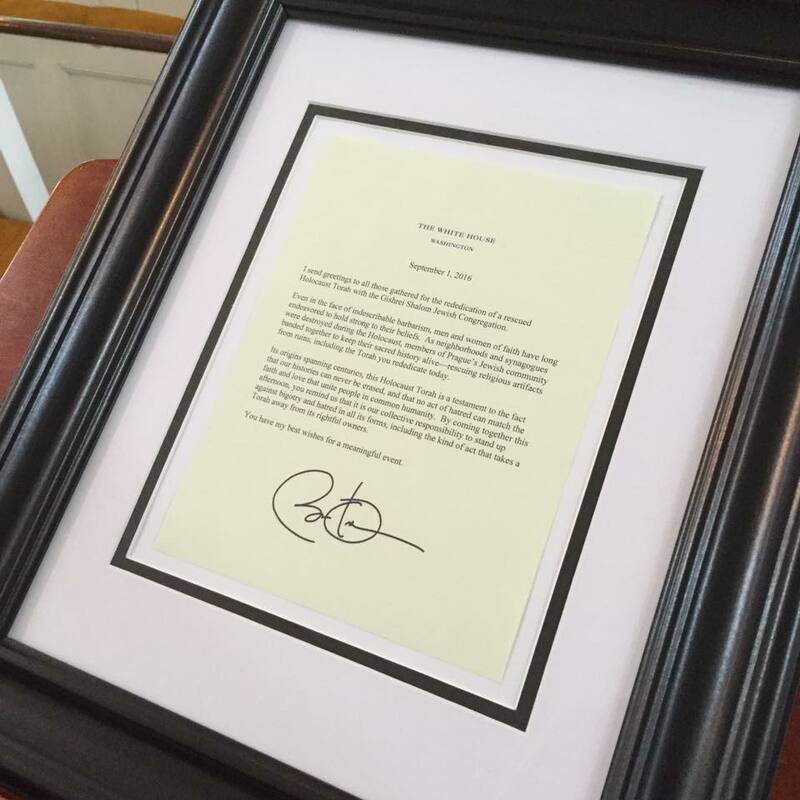 The President of the congregation, and The Chairperson of the Torah Restoration Committee, spoke and read proclamations from President Obama, Governor Malloy and the Southington Town Council in honor of the occasion. 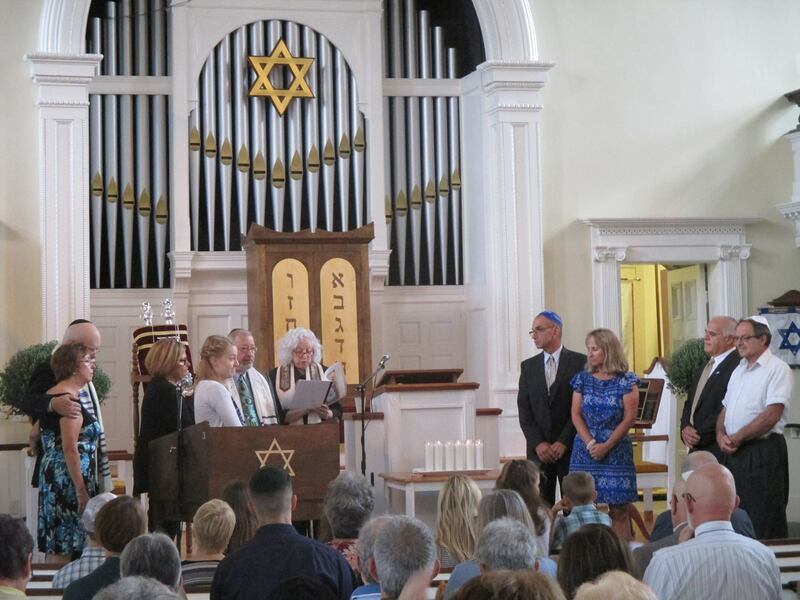 A plaque recognizing those who made the Torah restoration possible and remembering the Jews who were deported from the towns of Caslav and Golcuv-Jenikov was unveiled. 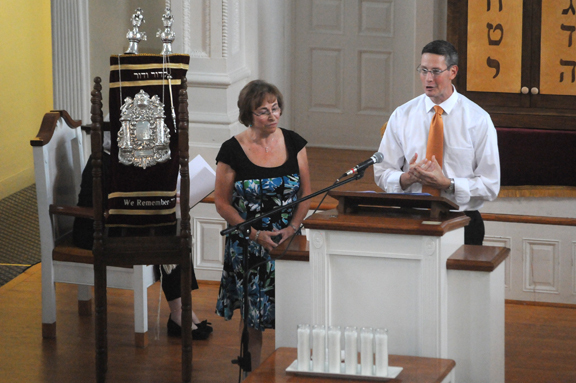 Our Rabbi offered a prayer rededicating the Torah and spoke to the children in the congregation about the significance of their bearing witness to this historic day and time. She adjured them to heed the words on the scroll cover: L’dor vah dor, Zachor: From generation to generation, remember! We read from Nitzavim in the rededicated Torah. 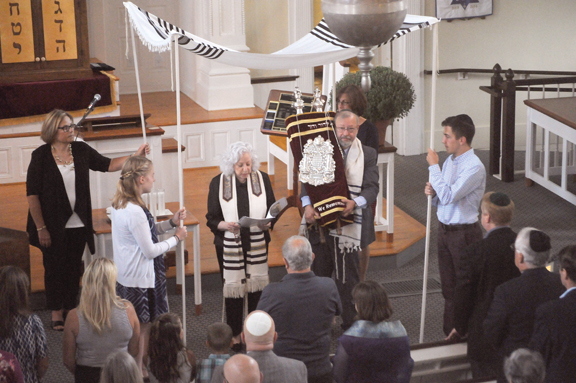 The reading included the verses that describe all of us standing at Sinai when Torah was given; the Torah is not far away, but close to us, in our mouths and in our hearts; and exhorting us to choose life. Candles were lit for the 6 million Jews who died in the Holocaust. 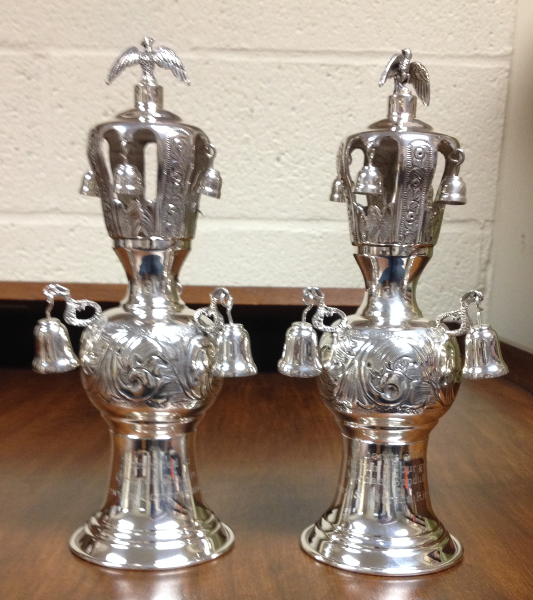 The Holocaust Torah Restoration Committee was instrumental in acquiring the Torah, raising funds for its restoration and arranging for the Rededication Service. 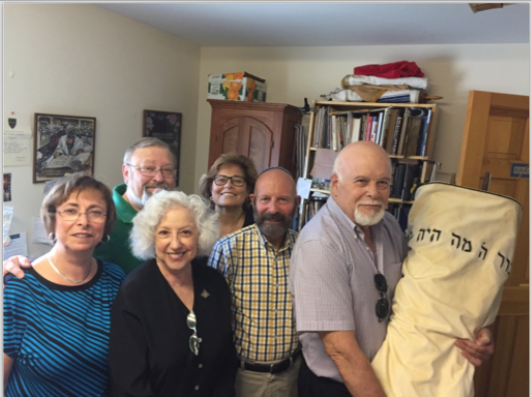 A yad for the Holocaust Torah was presented by the Congregation to our Rabbi at Shabbat services on May 30, 2014/2 Sivan 5774. 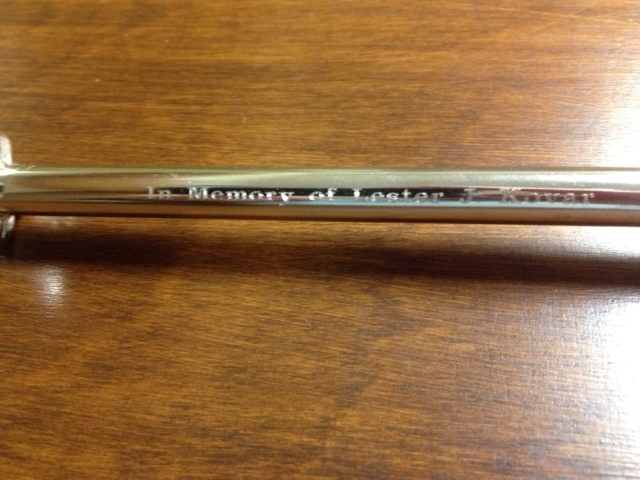 It is inscribed in memory of her father. The yad is pictured below. 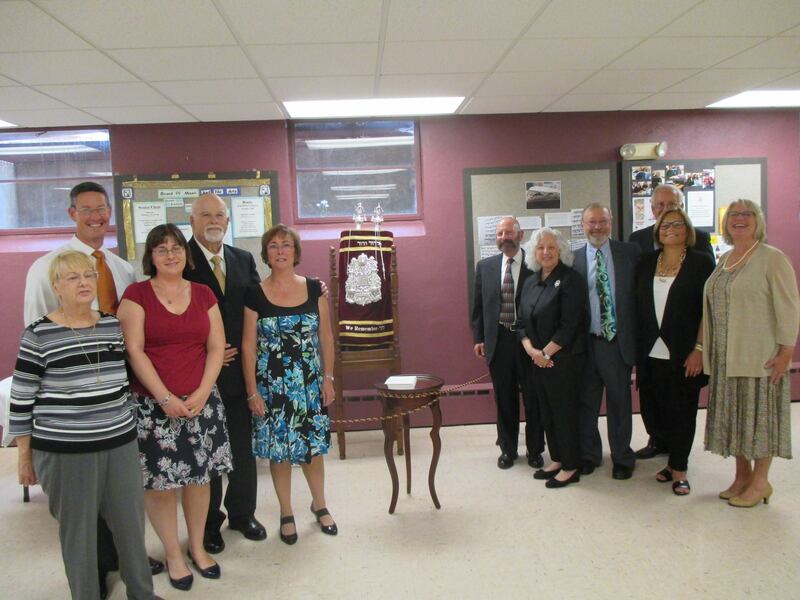 Read the Jewish Ledger article on preparing our Saved Torah for its trip to Florida to be repaired by Sofer on Site. 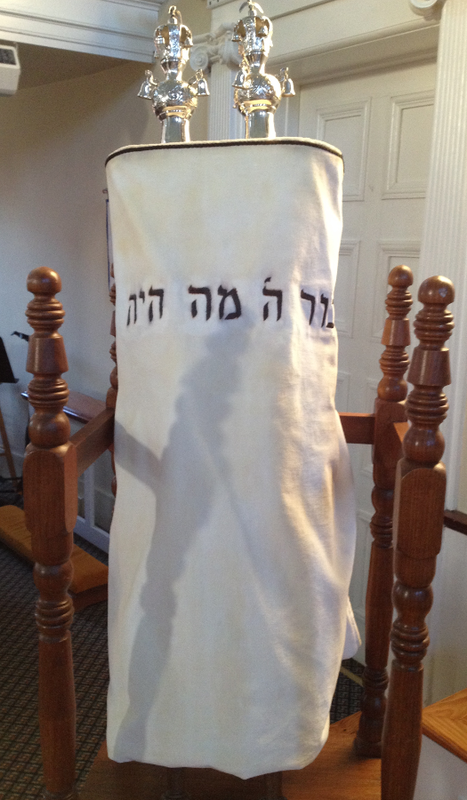 When our saved scroll came back this Spring from being repaired, it needed to be reattached to its etz chayim.